It's a simple fact of life that people spend a lot of their time in the showers. Taking one 15-minute shower every day for a year results in about 91 hours spent rinsing off under those jets of water. So it makes sense that you'd want to enjoy that time as much as possible. A good showerhead can make a simple shower much more enjoyable. There are a slew of options when it comes to modern showerheads. They come with a variety of different spray patterns and finishes, and your showerhead can even affect your water bill. The task of choosing the perfect showerhead can be daunting, which is why we here at Wise Bread have taken the guesswork out of it by picking the top five on the market today. 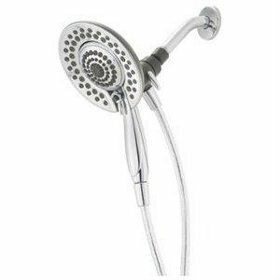 A showerhead is an attachment to a water source that is used to direct a flow of water onto a person for the purpose of bathing them. 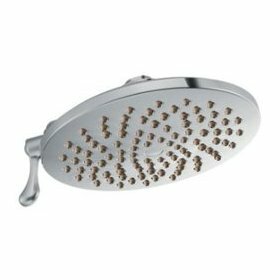 Showerheads can be made from a variety of materials, and they have holes in the end of them out of which the water pours. They are often mounted high up in a shower to allow ample room for individuals to stand underneath and are typically adjustable to direct the flow of water to the most desirable spot. This showerhead is the go-to choice for hotels all around the world. Many reviewers, in fact, claim that they bought this because they enjoyed the shower experience so much when on vacation. It is a top choice among individuals on Amazon. The Speakman Anystream Hotel Showerhead has 50 full-body sprays and eight massage jets in the center. The spray adjusting handle on the side is large and easy to grip, even with wet, soapy hands and can be used to switch the spray from a gentle rinse, to a therapeutic pulsating massage stream, to a full coverage wash. The Anystream pivots fully, making is simple to direct the stream of water wherever you like. Adjusters claim that it has an excellent width of spray. 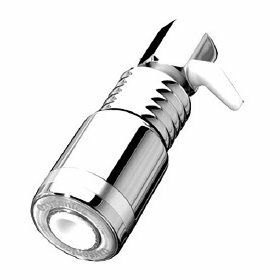 Due to US regulations limiting the amount of water a shower can output every minute, the Speakman Anystream Hotel Showerhead is equipped with a flow control restrictor. While many reviewers claim that leaving the restrictor in still results in excellent water pressure, others recommend removing it for an even better, more intense shower experience with extremely high water pressure. This showerhead uses 2.5 gallons of water per minute when the flow control restrictor is in, and it comes in polished chrome or brass options. This rain-can showerhead is highly recommended by Consumer Reports. Rain-can showerheads are categorized by their aesthetically pleasing design, which drops water straight down from above, creating a rain-like effect. The Moen Velocity Showerhead has two settings: a rain shower setting which is designed to relax and soothe, and a full setting which is more intense, with a concentrated spray for better rinsing. Both settings are very easy to select by using the side lever. The one downside to the Moen seems to be that, due to its large, 8-inch diameter, the flexibility of the showerhead position is somewhat limited. Some reviewers reported having to buy an extension pipe to accommodate the size. This showerhead uses 2.5 gallons of water per minute on both settings, and it comes in chrome, antique bronze, brushed bronze, brushed nickel, and oil rubbed bronze for varying prices. This water-saving showerhead is a recommended buy on Consumer Reports and is ideal for anyone concerned about water waste and saving money. It claims to use about 40% less water than other, standard models. The American Standard FloWise Showerhead has three spray settings: massaging turbine spray, full spray for a more intense flow, and combination spray. Since turbine spray saves the most water and energy, the showerhead automatically reverts back to that setting after each time the shower is turned off. The turbine setting is ideal for households in which there are several people showering one right after the other and they don't want to run out of hot water. The showerhead is fully angle adjustable. Some reviewers disliked the design and the large shape. This showerhead uses 2 gallons of water per minute on full spray, 1.5 gallons per minute on turbine spray, and 1.8 gallons per minute on combination spray. It comes in chrome, satin, black, stainless steel, and polished brass finishes for varying prices. This water-saving, bare bones showerhead is a cheap option that will save you money by reducing water consumption. It claims to use up to 70% less water that other standard showerheads. The Oxygenics Skincare Showerhead has only a single setting, making this a less than ideal choice for anyone who likes options when showering. Reviewers claim that it is perfect for anyone who has very low water pressure. It uses aeration, meaning it mixes air with the water, to produce a feeling of high water pressure. The issue with this is that it tends to cool water down, meaning you may end up using more hot water than usual. This is something to consider if you tend to have many people showering after another and are prone to running out of hot water. You can purchase the Oxygenics with an optional comfort control lever, which adjusts the strength of the spray. This showerhead uses only 1.5 gallons of water per minute and comes in chrome, gold, or chrome and gold. Another recommended buy in Consumer Reports, this multi-setting option features both a standard, wall mounted showerhead, and a removable hand shower. This makes it perfect for anyone who likes some versatility in their bathing time. The Delta In2ition Showerhead has five different settings, including a pause feature, which reduces the water to a trickle to conserve water while shaving or lathering up. The other settings include slow massage, fast massage, full spray massage and full body spray. The dual showerheads can be used together or separately to give you maximum control over where the water flow is directed. A tjree-way diverter valve allows all the water to be diverted to the wall mounted shower, all the water to be diverted to the removable hand shower, or the water to be split evenly between the two. 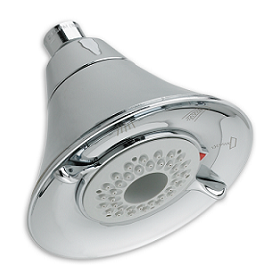 This showerhead uses 2.5 gallons of water per minute and comes in chrome or satin nickel options. I haven't experienced using the Speakman Anystream Hotel Showerhead in any hotel but I was amazed with the quality review of this product. I will really put this in my to buy list. My favorite shower is the Delta In2ition Showerhead as I find it to offer the best features relative to its price range. This is a nice article, however I would highly appreciate it if you mention more than just 5 showerheads in one of your future posts. 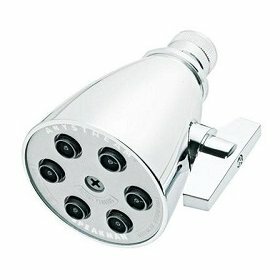 All of these 5 shower heads are great but in my opinion, the delta in2ition shower head is the best among all these. By the way, nice post - You summed up pretty well. Anyways, there are other great shower heads too. Perhaps you could expand this article by mentioned more of the good shower heads out there. All great choices! My vote is definitely the Moen Velocity though!